The Hilton Garden Inn Findlay’s 2nd Bridal Open House will take place Sunday, February 10th from 1-3pm (rescheduled from January 20th due to weather). The free event will showcase their ballroom – decorated in several styles – and allow attendees to speak with the venue’s event coordinators, as well as a selection of local wedding industry experts. The local vendors featured at the open house include Trends! On Main, Jen’s Buggy Whip Cakery, Gina Lynn Floral and Designs, Bliss Cinema Productions, The Gilded Chair, A1 Tent Rentals, Advantage Limo & Coach, Your Perfect Day, J & J Limo, Shirley’s Popcorn, Ignite the Arts, Knoch Photography, All Occasions, Decorative Sound, M&T Photo Booth, They will be available to talk, answer questions, and will have plenty of samples, examples, demonstrations, and information on hand. The hotel features tailored event planning services, taking some stress off the shoulders of the engaged couple and their families. Through their experience and expertise, the event coordinators are happy to make menu suggestions, and offer guidance throughout the reception planning process. 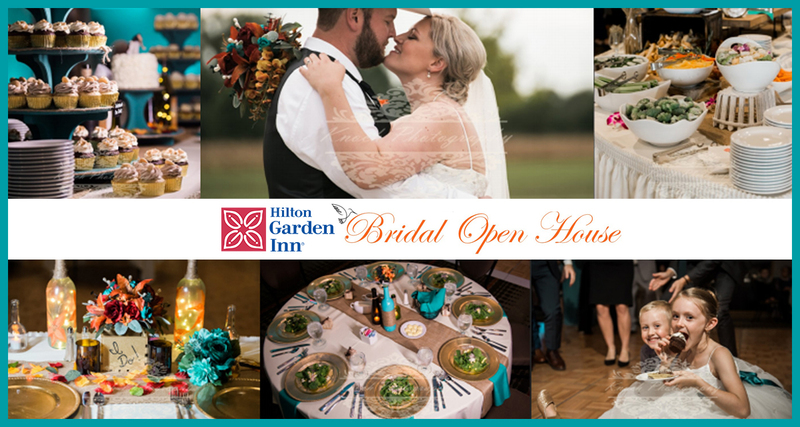 The Hilton Garden Inn provides complete setup and teardown service, full service catering, and bar packages for your event. If you have a big guest list in mind, have no fear! Their ballroom can accommodate up to 275 seated guests. Additional FAQs can be found here. Entry to the event is free and open to the public. No RSVP is required, although feel free to mark yourself as going and invite friends via the Facebook event. Complimentary hors d’oeuvres will be offered, and a cash bar will be available. There will also be door prize drawings and exclusive promotions over the course of the event. If you have questions, you can contact the hotel at gerrie.hayes@hilton.com or (567)250-2525.